Two weeks ago I wasn’t so much familiar with the terms static analysis and analyzer. I mean, I heard those terms here and there but didn’t really give it a proper look. Then comes the time when Patrick Smacchia (Creator of NDepend) asked me to give NDepend a go. So I found it as an opportunity to learn about these stuffs and here I’m writing a blog about it. ‘Nuff history lessons. Let’s talk about what static analysis or analyzer really is. Many chooses the different way, by doing the camel casing and not adding the underscore. While these aren’t actually causing any problems in your codebase but at the same time it is making your codebase messier. I remember that I asked my seniors about this issue and the answer I got was pretty much absurd, “Just use one of them!”. Now think it from your perspective. Wouldn’t it be great if you have a tool that helps you resolve this kind of situations? Wouldn’t it be great if there is a tool that will warn you if you define a private field without adding an underscore (_) in front of it and every developer who is working on the project is bound to follow the rule? Don’t worry there are tools for doing these kind of analysis. And they are called static analyzers. NDepend is one of them. NDepend doesn’t only warn you about these kinds of naming issues but also warns you if your codebase breaks any of the object oriented design principles(SOLID) and software design patterns and practices and many more. Good thing is these patterns and practices are not the product of any rocket science experiment over the night rather these are well known and industry accepted. So far we’ve been talking about rules and regulations. 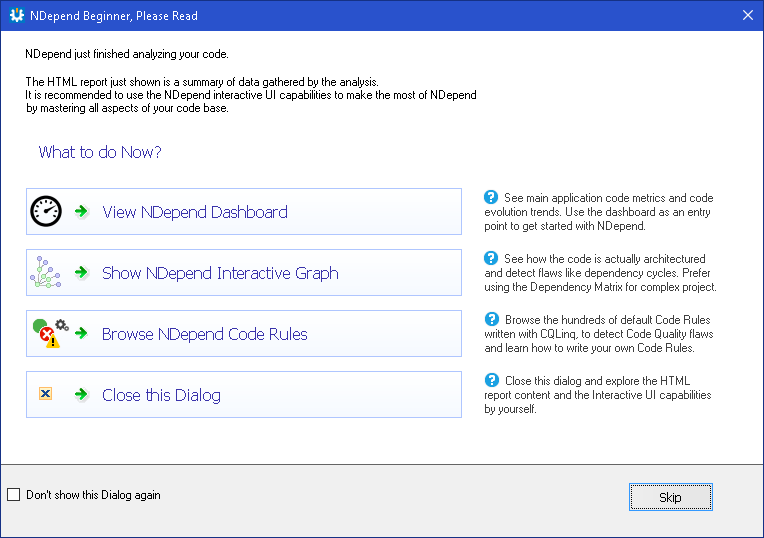 But NDepend has many other options which can help you have a deep application insight of your project like dependency graph, code metrics, test coverage etc. Now that I’ve taken and placed NDepend on the top of the mountain, let’s play around with some of its features and see if it’s really worth our time and money. 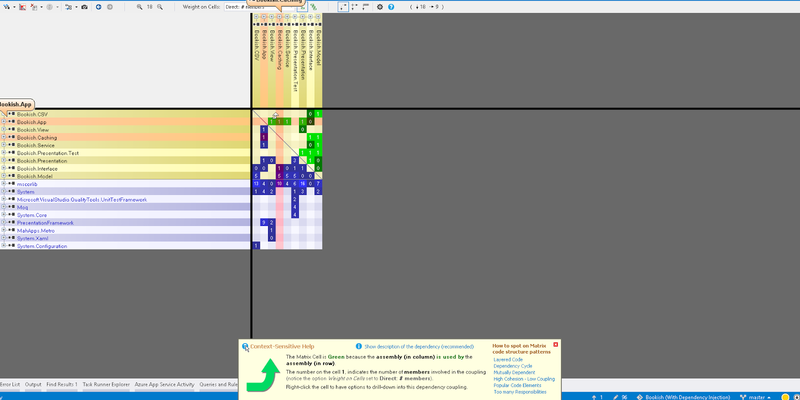 As you can see there is Visual Studio extension for NDepend. I’ll be demonstrating features of NDepend in Visual Studio, so I’ve already installed it with the extension installer. You can also try the NDepend.Console and the VisualNDepend exes. You will find a lots of resource on their official site on how to use these two exes. 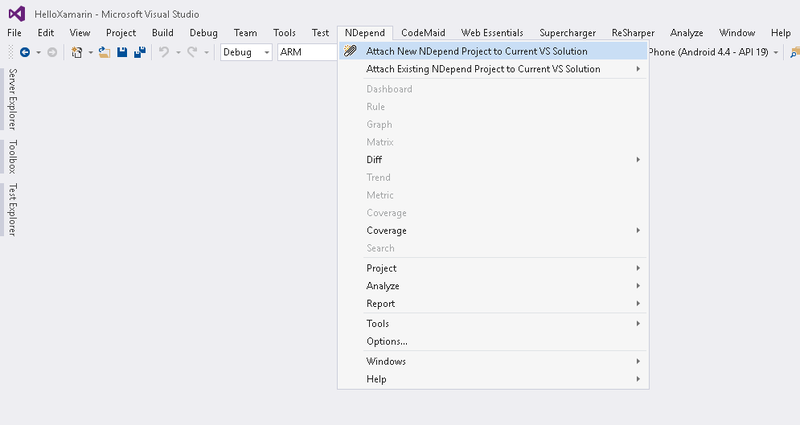 After installing NDepend, you will have a NDepend menu in Visual Studio from where you can initialize a NDepend project for your current solution. Clicking on the Attach New NDepend Project to Current VS Solution will start doing some analysis on your solution and this dialog box will pop up. Okay, now this is the starting point. If you scroll through the report, we will see some interesting insights of your project. Like application metrics where you can see how many lines of code have been written so far in the codebase, how many of them are useless (dead code). You can also see how many types, namespaces, assemblies are available in your solution and how much of your project is dependent on third party libraries. How much test coverage your code has and how complex your methods are? 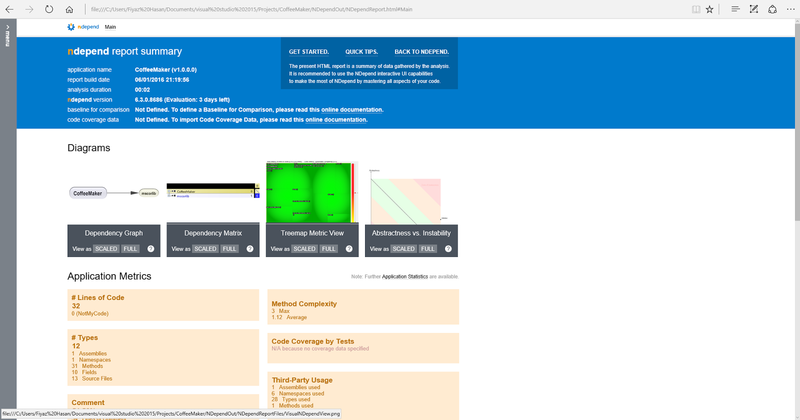 As you can see these are lots of information that you are getting just by a single click on the mouse. Although not all rules can be satisfied but you got the idea. Let’s get back to Visual Studio and see if we can fix some of these issues. Click on the option Rule > View Explorer Panel . 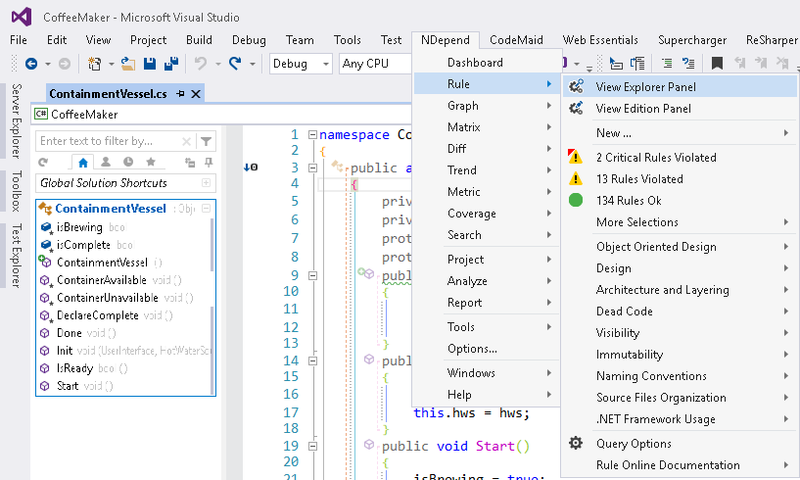 Visual Studio will open up a Query and Rules Explorer window. As you can see there are some ruleset ready for you. One of them is “Object Oriented Design”. Some of these predefined rules are violated in my code example. So let’s fix one of them. Its saying that Class with no descendant should be sealed if possible and showing the classes that violated the rule on the bottom right panel. If you open any of the classes, you will see that these are abstract classes and abstract classes can’t be sealed and static. So, we don’t have much to fix in here (As I told you, Not every rules can be satisfied). In Visibility rule set, you can see that we have a warning saying that Constructors of abstract classes should be declared as protected or private. 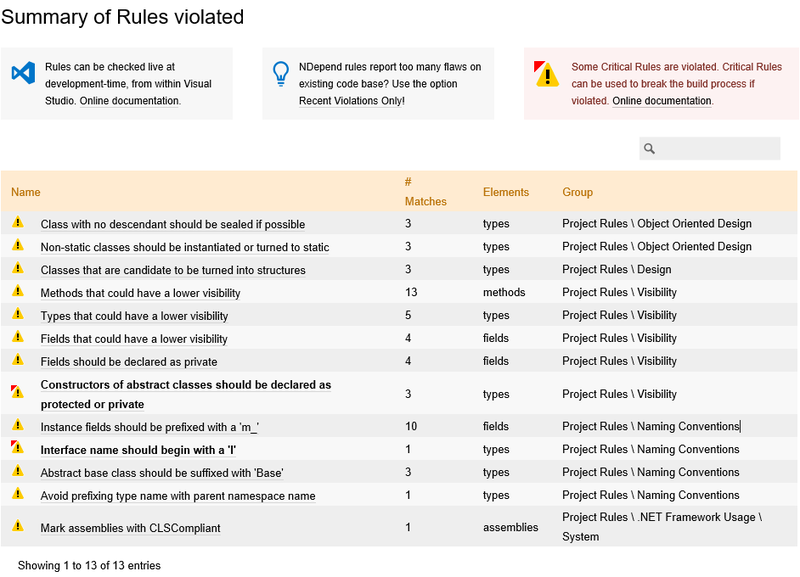 If you notice on the top right explorer these rules are merely some Linq queries (more precisely CQLinq). These queries use reflection on your codebase and give you the result based on the output. Let’s shift our gear and talk about dependency graph. Here is a dependency graph of a pet project of mine called Bookish generated by NDepend. As you can see how easy it is to have an eagle eye view of the dependencies. In the image given abode I’ve placed my mouse cursor on the assembly called Bookish.Caching and NDepend’s interactive dependency graph immediately shows all the dependent assemblies in green (Bookish.App). All the assemblies that my Bookish.Caching depends on is highlighted in blue. View Dependency Matrix option provides the same information in a matrix form. 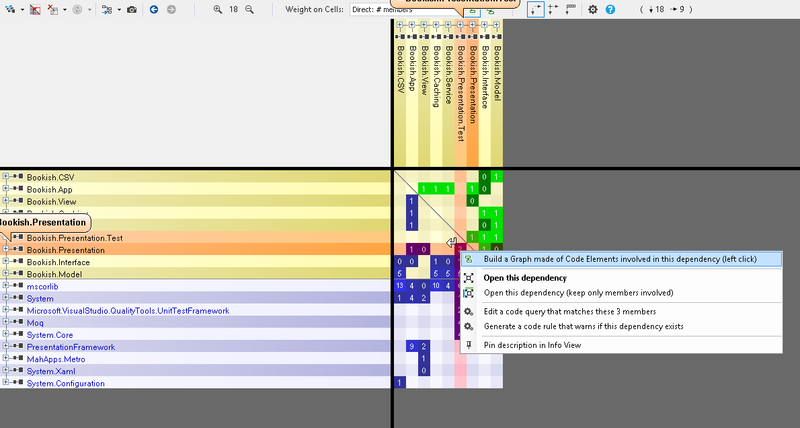 If you hover over any of the cell, NDepend will give you some context sensitive help. You can have test coverage of your codebase. I’m using Visual Studio Community Edition so I don’t have the option for Analyzing Test Coverage (only available in Enterprise editions) from the IDE. You can use some other coverage tools (dotCover, NCover) also to export test coverage data and use it in NDepend. Then you can run some analysis on that data if you want. 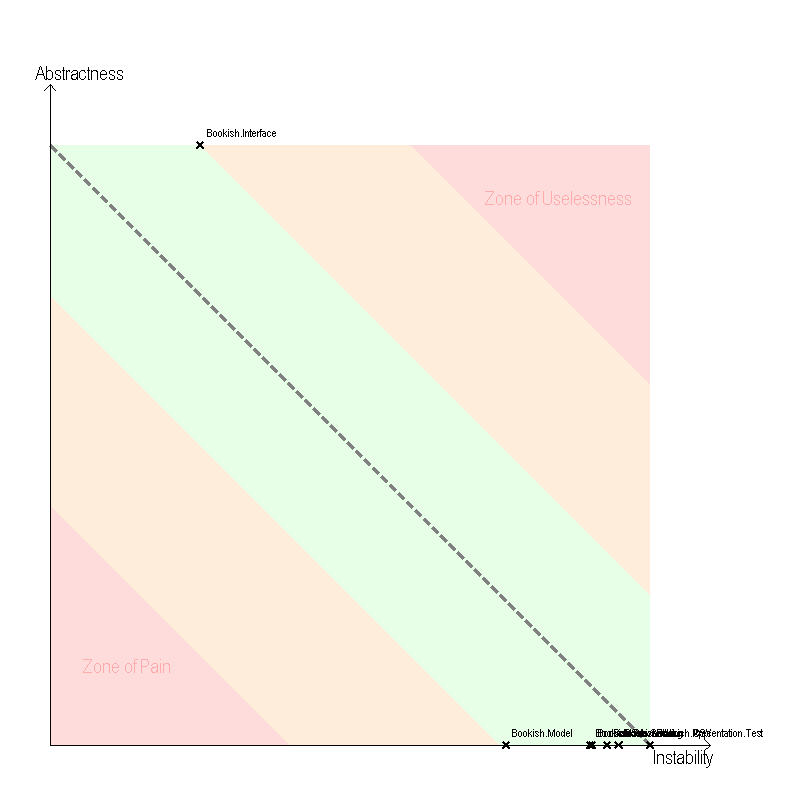 If I have assemblies that are not extensible then my assemblies would have fall into the Zone of pain section (lower left quadrant of the graph). Again if my assemblies are extensible but has no dependencies, that means those are useless and they will be in the Zone of uselessness(Upper right quadrant of the graph). As you can see in the graph the assembly called Bookish.Interface has maximum abstractness because I only have interfaces there and also has some uselessness cause not every assemblies is dependent on that. Last thing I want to talk about is the tree map matrix view. The squares in the graph are methods used in the assemblies. The size of the rectangle is proportional to the Line of Code in that method and the color represent the Cyclomatic Complexity of that method. Nice thing about this graph is, now I can easily see the complex methods in my assemblies and take appropriate actions against them. Okay, if you made it this far, you are now a NDepend Ninja!!! Well, I’m kidding. Here we only just scratched the surface of NDepend. There are lot of things that I ignore for the sake of simplicity of this post. Again the fact is I’m also new to this kind of tools and learning bits and piece every day. From my perspective, NDepend is a great tool to make our developing life somewhat easy. NDepend really shines when it is used in big projects. Think of it like this, if your project is a sea, you are a floating boat in it without a sail. If you want to reach the shore, then choose NDepend as if it is your sail.